Another big day has arrived at Root Rescue - today we launched our new online listings on Amazon.ca. We will be adding more Garden Centres and Landscape Trades Dealers to our distribution channel in the months ahead. 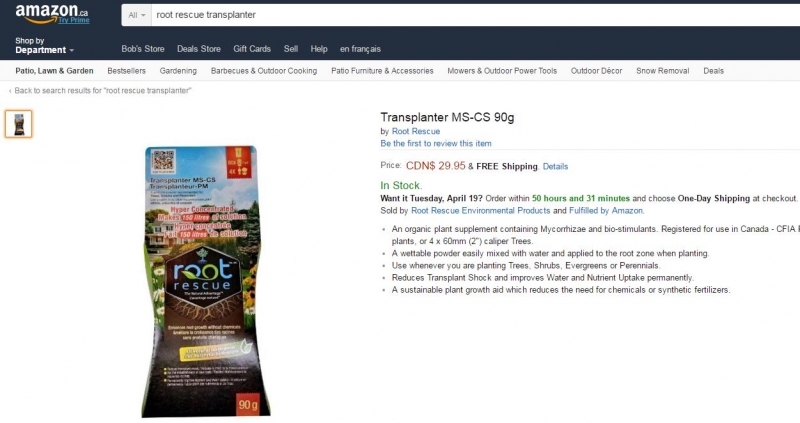 As we finish building our vendor network across Canada, we'll be using Amazon to give all Canadians online access to Root Rescue's new Transplanter MS-CS (with 18 species of mycorrhizae inside). If you're a Vendor and you'd like to offer your clients the latest technology for planting and caring for landscape plants organically, get in touch with Everett DeJong at Redbud Supply in Ancaster ON (our National Wholesale Distributor). If you're planning on planting some new perennials, shrubs, evergreens or trees in the next few weeks, Amazon can get Transplanter MS-CS right to your door in no time flat. We're working on getting Transplanter on the shelf at your favorite local garden centre - so that you can just pick it up with your new plants. 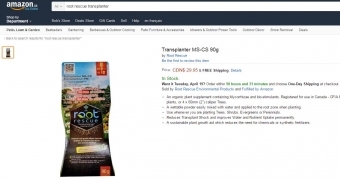 Retailers are bulk buyers of Transplanter, ans they may sell for less than the price listed on Amazon. We'd like your help with bringing Transplanter to your favorite local Garden Centre. Send us and email, and tell us where you buy your landscape plants and supplies. We'll get in touch with that Garden Centre and tell them that they've got regular customers ready to buy Transplanter. We have some very attractive offers for new vendors, we'll do our best to convince them that that they should be adding Transplanter to their line of organic plant care products.